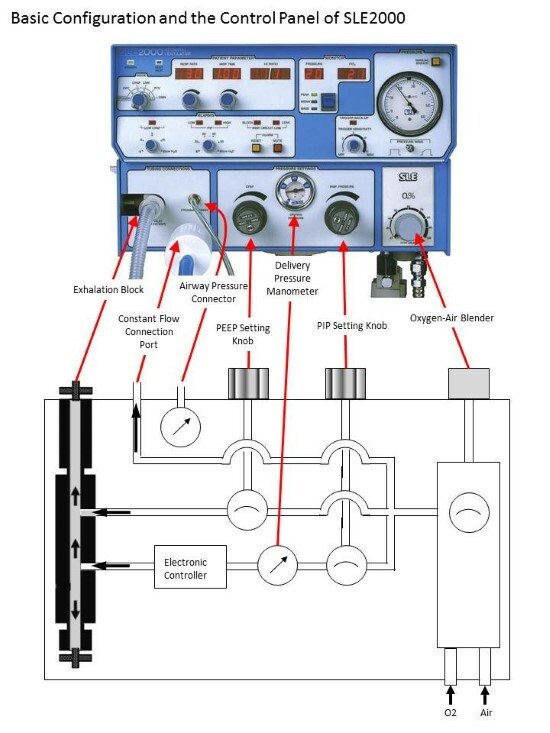 SLE2000 is a ventilator intended for premature neonates which provides CMV, PTV(Patient Triggered Ventilation), SIMV(Synchronised Intermittent Mandatory Ventilation) and CPAP(Continuous Positive Airway Pressure) using its unique pneumatic system that has no expiratory valve. Though it is not equipped with a flow sensor, its high-performance pressure trigger system allows the device to provide PTV and SIMV to premature babies weighing only 1000g. The mechanism without an expiratory valve reduces work of breathing. Also, the ventilator design relatively resistant to a tube leak is ideal for premature neonatal patients who are normally intubated with cuff-less endotracheal tubes. 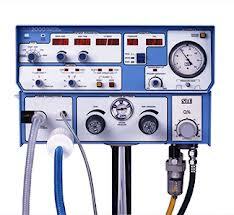 The most distinctive feature of the product is its unique pneumatic system that has no expiratory valve. Without expiratory valve, expiratory resistance is limited, allowing less work of breathing. Its basic design is based on the similar principle to the Jackson Rees airway’s (Fig.2). 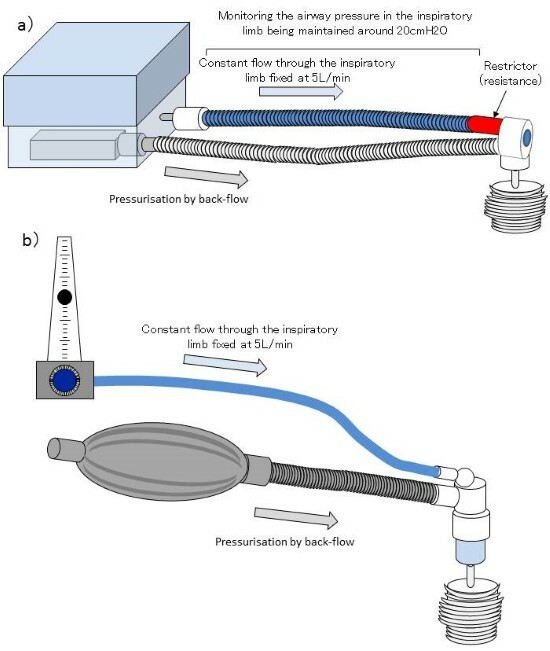 Constant flow fixed at 5L/min is delivered from the inspiratory port whereas a back-flow against this flow provided from the two nozzles of the exhalation block to generate PEEP and the peak inspiratory pressure. These two nozzles function as air valves and the exhalation block can be considered as an equivalent of a bag of the Jackson Rees airway. In this system, a tube leak can be compensated by increasing a back-flow. Unlike software controlled leak compensation of Babylog®8000plus, this so-called mechanical leak compensation is an ideal mechanism of a ventilator for neonates with cuff-less tracheal tubes which involve unavoidable tube leaks. Also, it is well compatible with nasal CPAP, which is to be explained in “SLE2000HFO”of this series. The exhalation block cover on the side of the ventilator should be securely attached to achieve normal pressurisation of the system. However, if the pressure rises normally even with a cover loosely attached, please note that an excessive pressure may be applied to the system when the cover is securely reattached. The respiratory rate range can be switched between 1-125 breaths/min and 126-250 breaths/min using the respiratory rate switch key located at the back of the ventilator. If the respiratory rate range is set at 126-250 breaths/minute, the usual respiratory rate adjustment will become unavailable. The pressure waveform can be selected from either an incremental ramp or square. The former is not compatible with breaths set at the respiratory rate of 60 breaths/min or more. Even without the power turned on, once the device is connected to the oxygen and air hoses, the gasses are consumed by ①leakage from the oxygen/air blender and ②the constant flow through the inspiratory limb. To avoid wasting gasses, do not connect the device to oxygen or air hoses when it is not in use. To set the back up respiratory rate for PTV, switch the current mode to either CMV or SIMV and make a necessary adjustment. Return to PTV after selecting the desired back up rate. The digital indicator shows only the number of monitored triggered breaths which do not include back up breaths. To check the back up rate, switch the current mode to either CMV or SIMV. PIP changes in accordance with the adjustment of PEEP. When PEEP is adjusted, it is necessary to reconfigure PIP (the PIP Adjustment Knob is for setting “above PEEP”). This product requires three filters in total to be attached at the inspiratory and expiratory ports. Each filter has a different purpose: ①reduction of noise from the system(the filter at the back of the exhalation block), ②prevention of bacteria invasion from a patient and an expiratory circuit, and ③collection of the moisture emitted from the exhalation block (the filter at the patient side of the exhalation block). The alarms of this device can be divided into two categories: ①Constant Inspiratory Flow Alarm and ②alarms related to proximal airway pressure (PEEP/CPAP Alarm, PEEK Inspiratory Pressure Alarm). The pressure in the inspiratory circuit is maintained at 20cmH2O by the restrictor (resistance connector) located at the immediate near side of the mouth connector of an inspiratory circuit and the pressure is under monitoring at all times. If the pressure drops below 17.5cmH2O, Leak Alarm will operate. Conversely, if the pressure goes beyond 80cmH2O, Block Alarm will go off. As for the proximal airway pressure, when the baseline pressure decreases below the set threshold, PEEP/CPAP Alarm will operate. With regard to Peak Inspiratory Pressure Alarms, when the inspiratory pressure drops 4cmH2O below the set threshold, LOW Peak Inspiratory Pressure Alarm will operate. When the inspiratory pressure increases 4cmH2O above the threshold, HIGH Alarm will operate. When High Peak Inspiratory Pressure Alarm operates, the pressure is relieved for safety. PEEP/CPAP Alarm goes off. With regard to the Peak Inspiratory Pressure Alarms, when the inspiratory pressure drops 4cmH2O below the set threshold, LOW Peak Inspiratory Pressure Alarm is triggered. When the inspiratory pressure goes 4cmH2O above the threshold, HIGH Alarm operates. Upon the occurrence of the High Peak Inspiratory Pressure Alarm, pressure is relieved for safety. Leak Alarm goes off not only when the inspiratory circuit pressure drops but also when the Peak Inspiratory Pressure Alarm setting is far below the pressure setting set using Peak Inspiratory Airway Adjustment Knob. In such a case, the alarm setting is given priority over the pressure setting made by the adjustment knob and hence the peak inspiratory pressure will not go beyond the alarm threshold. Also, as the inspiratory time is shortened and fails to comply with the setting, the device may appear faulty. To recover the normal operation of the ventilator, either raise the Peak Inspiratory Pressure Alarm setting or decrease the Peak Inspiratory Pressure setting which is to be set by the adjustment knob. This phenomenon may be overlooked if Leak Alarm is considered to go off only when the inspiratory airway pressure drops. Pressure trigger methods employed by other ventilators usually use absolute negative pressure created by a patient (ex. -0.5cmH2O). However, SLE2000 monitors the change rate of the pressure at mouth and detects triggers. In this method, the trigger sensitivity can be considered more acute than in other pressure trigger-type ventilators. 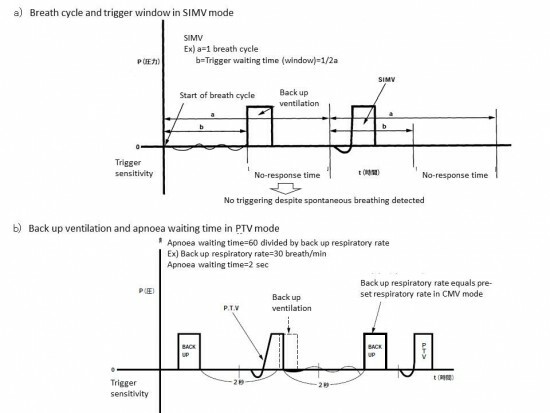 In SMIV mode of SLE2000, the first 50% of one breathing cycle (inspiratory time +expiratory time) is a trigger window. If a spontaneous breath is detected within this timeframe, a mandatory breath is delivered. If not, asynchronous mechanical ventilation is provided (Fig.4-a). 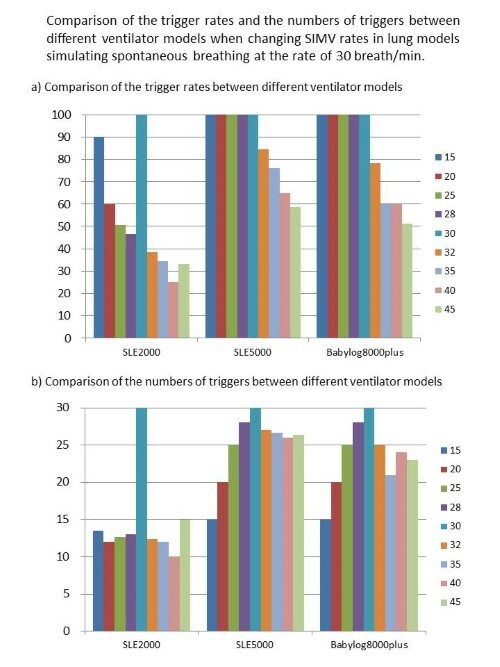 Using an artificial lung model simulating spontaneous breathing at the rate of 30 breaths/min, trigger rates of SLE2000, SLE5000 (the same series ventilator) and Babylog®8000plus were compared at different SIMV rates from 15 breaths/min to 45 breaths/min. Though both SLE5000 and Babylog®8000plus maintained good trigger rates at different SIMV settings, the trigger rate of SLE2000 significantly dropped when SIMV rate increased/decreased only by 2 breaths/min (Fig.5) from the rate of spontaneous breath. 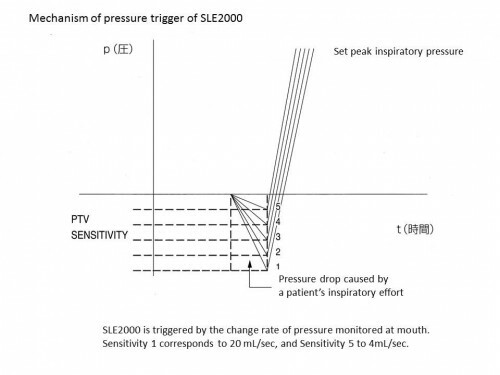 When setting SIMV of SLE2000, it is necessary to pay more attention to the rate of spontaneous breath than other models. In some cases, PTV mode may be more suitable than SIMV in terms of trigger rate as PTV has no “no-response time” to a respiratory trigger. When apnoea occurs in the PTV mode, Apnoea Waiting Time is the result of 60 seconds divided by back up respiratory rate. After the waiting time elapses, a patient is mechanically ventilated at a pre-set back up respiratory rate until a spontaneous breath is detected (Fig.4-b). Trigger window of SIMV can be set either by the fixed time method or the variable time method. As in the case of SLE2000, the fixed time method provides a trigger window at a fixed percentage in a breath cycle. In this method, trigger timing is fairly stable but asynchronous mechanical ventilation occurs frequently. On the other hand, the variable time method sends mechanical ventilation to every spontaneous breath within the predetermined SIMV rate. However, problematically, the timing of mechanical ventilation is loose and unstable.